This program is cumulative in nature. For best results, start with Lesson 1-The Game! 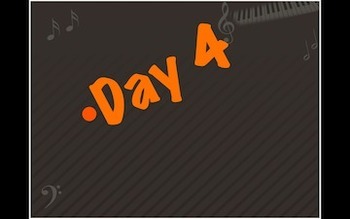 By Lesson 12 of S-Cubed, your students are rockin' and rollin' with their Sight Singing! 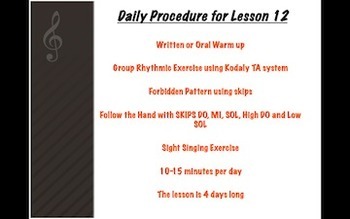 By now, you have created daily habits that include games, exercises and procedures that helped your students look forward to their 10-15 minutes of Sight Singing every day rather than moan with dread! Lesson 12 is a four day offering. In the lesson, we harken back to an earlier lesson in the S-Cubed training system where we focused on training the eye. In this lesson, we start the process of helping the students to recognize rhythmic patterns and intervals in their examples. 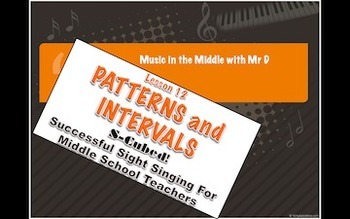 Lesson 12 includes 4 Sight Singing examples, 4 group rhythm exercises introducing Eighth notes, YouTube links that include teaching tips for every single day, and YouTube links of Mr D actually teaching the material to his students so that you can get ideas on how to approach the material to help it work for your upper elementary and middle school students. Join the S-Cubed Sight Singing program today and your young, inexperienced singers will be Sight Singing fluently in just a matter of months. To see what to expect from Lesson 13, click here! Not quite ready for that commitment? Please rate my program and send feedback! Contact me at dduncan158@gmail.com if you have any questions, concerns or need guidance in any way! 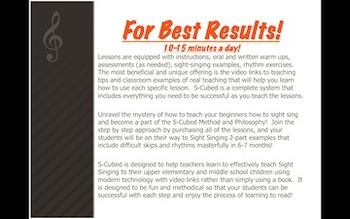 Join the S-Cubed Sight Singing program today and your young, inexperienced singers will be Sight Singing fluently in just a matter of months...one successful step at a time....the S-Cubed way! Contact me at inthemiddlewithmrd@gmail.com if you have any questions, concerns or need guidance in any way!